NewYorkCostumes.com 212-673-4546 Halloween Adventure Union Square: Mardi Gras vs Masquerade Ball. The difference matters. 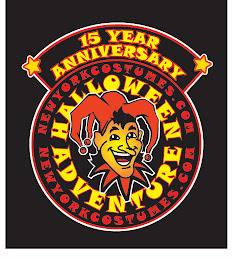 New York Costumes (Halloween Adventure in the East Village), at 104 4th Ave and 808 Broadway @ 11th street. We have the largest retail selection of costumes, wigs, masks, props, and décor in New York City. We also have costume and prop rentals, as well as a magic section. Infused with an insanely organized and creative atmosphere, our shop offers a unique shopping experience! Mardi Gras vs Masquerade Ball. The difference matters. She would like to remind readers and party-makers that while a Mardi Gras theme party may be a masquerade party, not all masquerade parties are Mardi Gras parties. Both Mardi Gras and masquerades often call for elaborate masks and finery, but the Mardi Gras party has a more specific focus; Mardi Gras conjures up images of jesters, beads, Bourbon Street, New Orleans, green and gold and purple, and drunken revelry. On the other hand, "masquerade," while technically defined as any party where masks are worn, often calls up images of a masquerade ball - finely dressed ladies and gentlemen dancing and adorned in Victorian style, chandeliers, ornate decorations, and high formality. Oriana suggests that shoppers and party-makers have a good idea of whether they want their parties to have a "Mardi Gras" feel or a "masquerade ball" sort of vibe. She then suggests that shoppers use the most appropriate terminology that will help them in their search for masks and party supplies. Is your masked theme party a Mardi Gras bash or a masquerade ball? Or is it somewhere in between? Even if the masquerade party to are planning doesn't fit into the categories of a ball or a Mardi Gras bash, you can use these examples as ends of a spectrum to describe the party to are creating. It will help you shop, and it will help your sales associates to serve you better. Click the Image to Visit Our Website for our NYC store! Bead Giving Season is a-Coming in! Mardi Gras! ColorFlame Candles. Light up my life! Celebrity Sighting at New York Costumes! SantaCon is coming to town. What to wear? !